The Ultimate Fighting Championship presents UFC FIGHT NIGHT 31 tonight from Fort Campbell, Ky. 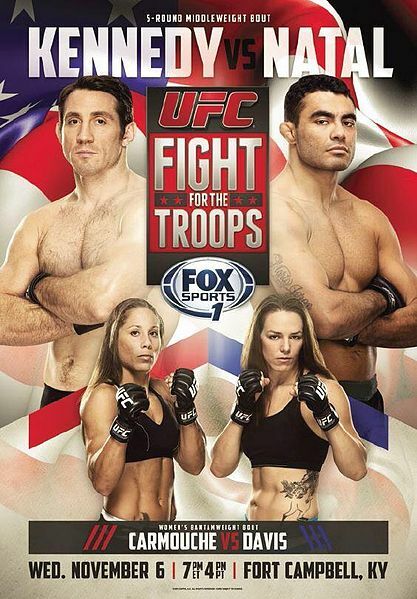 This Fight for the Troops card is headlined with a middleweight bout between Tim Kenndy and Rafael Natal. The main card of UFC Fight Night 31 will air LIVE on Fox Sports 1 starting at 7 p.m. ET. ProMMAnow.com will provide LIVE results and play-by-play commentary of all the action. ROUND 1 – Touch gloves. Kennedy catches a kick, lands a counter right. Natal with a counter right, spin kick. Leg kick Natal. Two high kicks from Kennedy are blocked. Left hand from Natal. Kennedy looks sort of nervous/tense. Right from Natal. Natal looks more relaxed, and he scores a quick takedown but Kennedy is quickly back up. Powerful leg kick from Natal drops Kennedy. Back up. Natal switching stances. Powerful body kick from Kennedy. Kennedy with a couple leg kicks. Quick left hook from Kennedy drops Natal to the canvas and he follows up with a big right hand and this fight is over. Chants of “USA” ring out in the hangar at Fort Campbell, Ky. ROUND 2 – Right from Carmouche. Leg kick Davis. Right hook from Carmouche. Knee from Carmouche to the body. Davis is cut over het left eye and is bleeding. Leg kick Davis, again. Carmouche with a leg kick. Davis connects with punches against the cage. Front kick Carmouche. Davis stalking. Right hook from Carmouche out of the clinch. Big leg kick from Davis. Big inside leg kick Davis. Again. Connects with a right hand. Leg kick Davis, catches a kick and dumps Carmouche. Davis in side mount. Carmouche scrambles to the top before the bell. PMN sees it 10-9 Davis. ROUND 3- Big inside leg kick from Davis, Davis presses Carmouche to the cage, lands a few knees to the thighs. Davis controlling her against the cage. Ref separates them. Davis stalking with punches. Leg kick. Again. Clinch against the cage, knees to the body from Davis. Leg kick Carmouche, Davis returns leg kick inside. Body shot Carmouche. ROUND 1 – Touch gloves. Big inside leg kick from Markes. Romero returns leg kick. Oblique kick. Leg kick, body kick from Markes. Markes grabs a kick and puts Romero down, right back up. Leg kick Markes. Big left hand from Romero. He slips on a kick. Clinch, takedown from Markes. On top in half guard. Left from Romero. Left from Romero. Body kick Markes. Leg kick Romero, shoots, stuffed. Front kick Markes. PMN sees it 10-9 Romero. ROUND 2 – Body kick Romero. Clinch, elbow, knee. Straight left, left. Left again. Knee from Romero, drags Markes to the ground by the neck, lets him up. Left from Romero. Body shot Markes. Nice left from Romero. Markes shoots, stuffed. Leg kick, body kick from Romero drops Markes. Ref lets him up. Body kick Markes. Flying knee, body kick from Markes, aggressive now. Big right scores. Body kick. Nice left from Romero, right from Markes. Again. Great round. PMN sees it 10-9 Markes. ROUND 3 – Markes shoots, stuffed. Accidental eye poke from Romero. Brief time out. Nice left from Romero, again, Markes staggered. Another left. Leg kick from Markes. Huge left drops Markes, Romero follows up with a right hammerfist and a left and Markes is out. ROUND 1 – Big overhand right from Khabilov. Leg kick from Masvidal. Left jab from Masvidal, Khabilov returns with a right. Leg kick Masvidal. Right from Khabilov. Brief tie up, right hand on the break from Masvidal. Overhand right from Khabilov. Left right left from Khabilov. Masvidal pressing forward. Clinch, knee from Masvidal. Khabilov goes for a single, Masvidal stops it, knee on the break. Repeat. Body kick from Masvidal. Flying knee from Masvidal — but Khabilov catches him in the air and sweeps him to the ground. Masvidal back up, two knees to the body. Masvidal catches a kick, kicks the back leg. Khabilov catches Masvidal’s flying knee again. Leg kick Masvidal, caught, Khabilov presses him to the cage. Knee to the body from Masvidal. Close round, PMN sees it 10-9 Masvidal. ROUND 2 – Overhand right from Khabilov is blocked. Leg kick Masvidal. Nice left hook from Khabilov, followed by a right and another counter right after a leg kick from Masvidal. Body kick Masvidal. Leg kick. Khabilov using nice body/head combos with his boxing. Lands a nice right. Leg kick from Masvidal, clinch, knee. Right from Khabilov. Nice left right from Masvidal, he presses, leg kick. Left from Khabilov, leg kick Masvidal. Clinch, Masvidal presses him against the cage. Knee to body. Left to the body, right to the head from Khabilov. Masvidal walks him down and puts him on his back with a takedown. Masvidal throws some elbows and tries to pass guard before Khabilov gets to his feet. Khabilov shoots, gets a body lock from the back, drags Masvidal down briefly before he turns around and is looking for his own takedown — back to the feet. Right from Khabilov, knee from Masvidal. PMN sees it 10-9 Khabilov. ROUND 3 – Left from Khabilov. Leg kick Masvidal, again. Right hand. Khabilov on the outside circling and he lands an incredible wheel kick to the head that drops Masvidal, but somehow does not knock him unconscious. Khabilov attacks but Masvidal defends, scramble, back to the feet. Masvidal briefly gets a takedown before it’s right back up. Masvidal shoots, presses Khabilov to the cage, knee to body. Khabilov briefly trips to the ground, back up, they square up. Right left left from Khabilov, he catches a spin kick and takes Masvidal down. Masvidal rolls out of a body lock, back to the feet. Khabilov shoots, stuffed. Masvidal shoots, stuffed, Khabilov landing body shots. Back up, time. PMN sees it 10-9 for Khabilov and 29-28 Khabilov. ROUND 1 – Touch gloves. Chiesa flashing a right jab. Leg kick from Smith. Counter right from Chiesa, he then checks a leg kick. Smith goes high with a kick. Left hand, body kick from Chiesa. Smith gets a body lock and looking for the trip. Gets a body lock from the back and slams Chiesa. Chiesa sweeps, takes Smith’s back with a body triangle locked up and looking for a choke. Smith defending well so far. Chiesa looking for a neck crank. Tight body triangle from Chiesa but Smith gets free and takes Chiesa’s back, now standing. Body lock takedown from Smith, has Chiesa’s back and looking for the choke, now standing. Chiesa dives to the ground in attempt to spike Smith but he’s still on Chiesa’s back. Smith lets go and they square up. Time up, touch gloves. PMN sees it 10-9 Smith. ROUND 2 – Touch gloves. Smith shoots in, clinch, knees, pushes Chiesa to the cage, knees to thighs and body. Chiesa goes for a body lock takedown, Smith defends. Leg kick Smith. Left straight from Chiesa. Again. Smith ties him up against the cage. Chiesa with a judo throw takedown, Smith goes head first to the canvas, Chiesa takes Smith’s back and chokes him out quickly.